Warren Buffett said it best: "Someone's sitting in the shade today because someone planted a tree a long time ago." One of those big trees in the investing world is FAANG, an acronym for five high-performing technology stocks: Facebook, Apple, Amazon, Netflix, and Google (now Alphabet, Inc.). Let's find out how a cool $500 investment in FAANG would have fared over a six-year investment period. Since Facebook held its initial public offering (IPO) on May 18, 2012, this date will be our starting point. And it's a great one because Facebook's IPO at that time was the largest technology IPO in U.S. history, raising more than $16 billion. Let's imagine that you allocated exactly $100 to each one of the FAANG stocks. Assuming that you could buy fractions of shares, here's how many shares of FAANG you would have acquired back on May 18, 2012, rounded to the nearest hundredth. In this and all calculations throughout this article, we'll use the closing price. At the end of 2012, your initial $500 in FAANG would be worth $537, up 7.51 percent mainly due to a 32.43 percent jump in Netflix's stock price over the same period. You would have loved watching Netflix's stock price this year, as it went up 297.6 percent year-over-year, closing at $52.60. After 2012, Facebook traded sideways and didn't trade above its IPO price until July 31, 2013. But then it too ended 2013 strong with a 105.30 percent year-over-year increase in price. At the end of 2013, your FAANG portfolio would be worth $1,147.50, up 113.69 percent from the previous year. On June 9, 2014, Apple issued its fourth stock split — this time, a seven-for-one stock split. This means that your 1.32 would have become 9.38 shares. Earlier that year on March 27, 2014, Google executed a 100 percent stock spinoff, which is similar to a two-for-one stock split. All said and done, your portfolio's 2014 year-end value of $1,160.95 ended slightly above that of 2013 (a 1.17 percent year-over-year increase). What caused the small return? On December 31, 2014 the stock prices of Amazon, Netflix, and Google were down 22.18, 7.22, and 4.24 percent respectively from exactly the year before. Let's fast-forward a few years to May 18, 2018 and analyze the performance of our investment in FAANG against the most common stock market bench mark, the S&P 500. 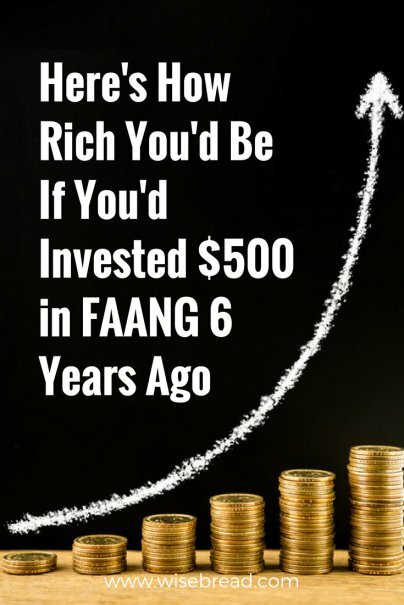 Assuming that you were to hold onto your entire $500 FAANG portfolio from May 18, 2012 until May, 18, 2018, your portfolio would have been worth a cool $5,059.62, a whopping 911.92 percent return over the six-year period. If you had put the same $500 investment in the S&P 500 you would have ended with $1,047.30 at the end of the six-year period. That's a very decent 109.46 percent return over the same six-year period, but far below that of the FAANG portfolio. Should you invest in FAANG? If it ain't broke, why fix it, right? After all, the FAANG investing strategy continues to pay off in 2018. However, this doesn't mean that you should put your entire nest egg in FAANG. Here are three key caveats when considering an investment in FAANG. "Does FAANG match my investment strategy?" This is the biggest question that you should ask yourself before considering an investment in FAANG. If you're very close to retirement age, are very adverse to risk, or require a consistent stream of dividend payouts for income, then FAANG stocks may not be right for you. Make sure to first analyze FAANG from the perspective of your portfolio strategy. As FAANG companies continue to push the boundaries of technology, the stock market continues to reward their valuation. However, sometimes the pendulum swings in the other direction. Remember the Facebook CEO's testimony before Congress on April 10, 2018 due to privacy concerns? The price of one Facebook share went from a high of $185.09 on March 16, 2018 to $165.04 on April 10, 2018. Could you have stomached a 10.83 percent loss over a 25-day period? If you hold an S&P 500 index fund, you're already exposed to FAANG. Let's assume that you hold the Vanguard 500 Index Fund Investor Shares. By owning one share of this Vanguard index fund, your portfolio has an allocation of 3.7 percent to Apple, 2.8 percent to Amazon, 2.7 percent to Google, and 1.80 percent to Facebook. And that's before taking account any other investments you might hold. If you also have another index fund in the technology sector, you probably have an even greater holding of each one of those investments. For example, the Vanguard Information Technology Index Fund Admiral Shares [Nasdaq: VITAX] has Apple, Amazon, and Google among its top four largest holdings. There are many mutual funds out there that already include Apple, Facebook, Amazon, Google, or Netflix among their holdings. Make sure to consider how much your existing portfolio already has allocated to FAANG before you add even more shares of these high-growth stocks. With individual shares of Amazon and Google trading at $1,574.37 and $1,066.36, respectively on May 18, 2018, it is impossible to make the same original investment of $500 to buy all five of the individual stocks that make up FAANG as we did in this experiment. Still, there is a simple way to start investing in FAANG: exchange-traded funds (ETFs). Similar to an index fund, an ETF tracks an asset or basket of assets. Unlike an index fund, an ETF can be traded several times throughout the day and doesn't require a minimum investment. There are three key reasons why ETFs make investing in FAANG more approachable for the average investor. The expense ratio (the percentage of assets deducted each fiscal year for fund expenses) for ETFs is generally lower than that for funds tracking the same type of investment. For example, the Vanguard Growth ETF has a 0.05 percent annual expense ratio, while the average annual expense ratio of similar growth funds is 1.10 percent. Some brokerage houses charge no trading fees when you stick to in-house ETFs. For example, users of the Vanguard Brokerage Account can trade without fees as long as they buy Vanguard ETFs. There is no minimum investment, so you could buy as little as one share of an ETF. Generally, prices for one share of FAANG ETFs range from $10 to a few hundred dollars. This prevents you from putting all your eggs in one basket. Remember that historical returns (even as great as those from FAANG) are no guarantee of future returns. So, you still should diversify your portfolio. Here's a list of FAANG ETFs to get you started on your research, but make sure to look at other lists as well. Buyer beware: By definition, a FAANG ETF is one that offers an investor at least 1 percent exposure to FAANG stocks. While diversification is great, select an ETF that best matches your target exposure to these five high-growth technology stocks.